Massage oils play a fundamental role in Ayurveda due to their relaxing effects and ability to balance the doshas. Oil treatments have always been an interesting topic in regards to Ayurveda. The reason being that human skin is able to absorb active substances. This is made possible by the bhrajaka pitta, which is one of pitta's sub doshas that is located in the skin. It serves to ensure that the nutrients are absorbed into the layers of the skin, where they are then able to unfold their effects. The fatty structure of oil gives it similar properties to that of fatty tissue. 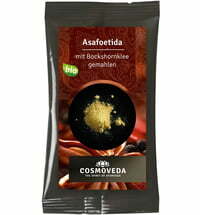 It dissolves and releases liposoluble toxins and deposits stored in the body. The added herbs harmonize the doshas. These are particularly beneficial in regard to vata disturbances for a balancing effect. Use only high-quality, organic oils that have been processed and matured according to Ayurveda as a basis for your desired massage oil. Take into account the different oils in respect to your type of constitution. Sesame oil is best suited for kapha and vata whereas coconut oil is beneficial for pitta constitutions. In addition to your base oil, it is recommended to also include jasmine blossoms and ginseng leaves (again, using quality ingredients is essential). Fill a glass bottle halfway with these blossoms and leaves, and pour the oil into the bottle until it is full. Close with a screw cap and store for three to four weeks. Once the oil is filtered it's ready to use. Use your massage oil to massage the temples, behind the ears, neck, soles of the feet, tummy and the inner wrists. 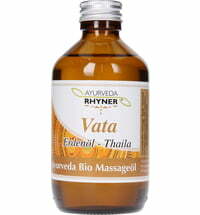 Base oil, massage oils and other massage tools can be found online at Ayurveda101.